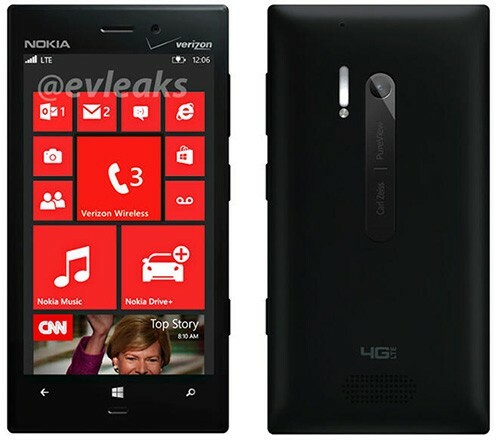 The successor of the top model "Nokia Lumia 928" of the Finnish manufacturer could be launched early April. The future top model Nokia begins to unfold. The Verge published this morning two photos front and back of the next model called Lumia 928 revealed by a tweet from @ evleaks as shown in the attached pictures. According to our colleague, the back of the device reveals the legal and 4G LTE offers a larger flash. The model is equipped with a new Xenon flash. The device would have the same dual processor heart 1.5GHz, 32GB of storage, 1GB of RAM, and a 4.5-inch OLED screen is diagonally similar characteristics at 920 . In addition to supporting LTE and flash, the main difference lies in the reduced thickness of 10.2 mm against 10.7 for the current model. One of the last questions for the weight of the device that was one of the main criticisms made in this model compared to its main competitors. However, it should not change much because the 928 is equipped with a polycarbonate casing as its predecessor, the aluminum casing to arrive in future versions. Microsoft and Verizon are currently in the final stages of testing and model updating integrate GDR2 (General Distribution Release) Windows Phone 8. The model could be launched in April.